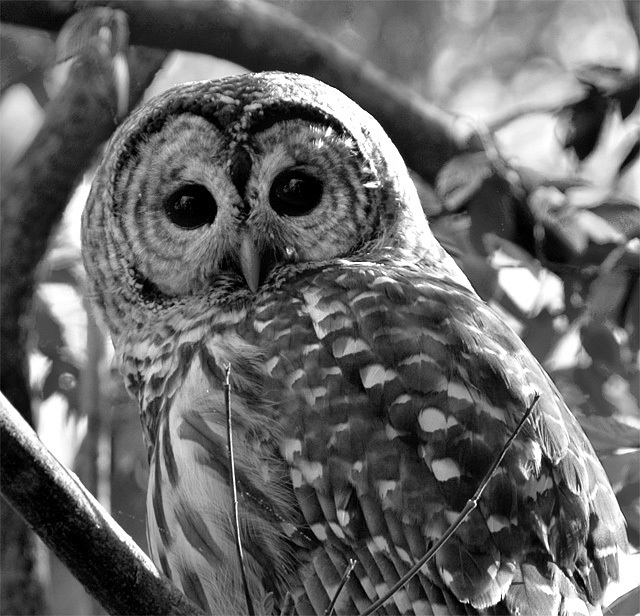 Our friend the Barred "Hoot" Owl decided to show itself in your side and backyard today when we got home from work. It sat on a branch about 20 feet away and stared at us for about 15-20 minutes. It is gorgeous. Shot in RAW - adjusted levels, exposure, saturation, curves a little, cropped, USM 25,50,0, Hue/Sat desaturation individual channels. Save for web. D/B around eyes, USM 85,0.5,0. Save! You're truly lucky to be able to be so close to such a beautiful raptor and for so long! I would love to see the shot in color as well. Cool shot. You were very lucky to get a shot like this in the daytime. They sometimes sleep in the open in the daytime here, and you can get pretty close to them if they feel safe about you being there. I like the B&W for this. Nice capture on the owl ... I would love to get a chance to shoot one one of these days.... good job pping his too ... the little catch light in the eyes make such a difference. Amazing shot!! I love the expression in the eyes. Great capture!! His eyes look so deep. No wonder folklore says they are wise. I think owls have the sweetest faces, despite the fact they can be pretty vicious predators. The detail and focus is spot on, especially with him being so far away!! Great detail shot. Nice DOF and tones. Nice conversion. Message edited by author 2007-05-16 07:29:05. Dang!!!!!!! You got a GOOD shot of this bird. This is BEAUTIFUL!!!! How lucky to have such a beautiful bird waiting for your camera! For not a lot of setup this is a really nice capture. Happy birthday to James. Hope he has even better presents on the way. Great DOF. I love the animal shots. Especially owls. The are so interesting. Nice tones and lighting. Great capture! What a lucky find! funny expression this guy has :) i like the dof. Nice capture. I really need to setup a bird feeder at home. Proudly hosted by Sargasso Networks. Current Server Time: 04/18/2019 09:10:58 PM EDT.